Our most beautiful line of billiard tables has been priced to sell!! Hand carved, stained cherry finished maple accentuating a solid slate table is just one of the many touches that make this our best seller! Welcome to your One Stop Shop for Billiards & Accessories! Want a Billiard Table at the most absolute rock bottom price? Need to find a 9 foot Snooker Table? Interested in what you can find for a price that would be laughed at by regular pool companies? Then you have hit the right place. 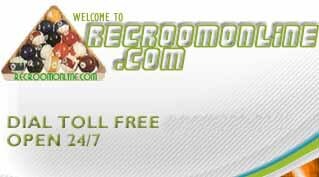 Recroomonline.com gives the consumer the best quality for the lowest price! Guaranteed!! !